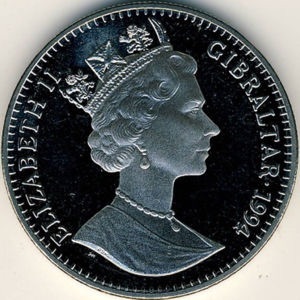 Gibraltar released 8 different designs for its 1994 series of coins commemorating the 100th anniversary of the return of Sherlock Holmes. In this post, we will discuss the three coins that feature a story that doesn’t involve Sherlock Holmes – the Mary Celeste. Inspired by the real case of the ship Mary Celeste which had been found abandoned and drifting in the Atlantic Ocean off Portugal, under full sail, Conan Doyle was one of the first to publish a version of what happened. He drew heavily on actua facts but included significant differences that have since been accepted as fact to the real story, not least in calling the ship the Marie, rather than Mary, Celeste. Some journalists even took his account for real. The ship was brought into Gibraltar for salvage and folks refer to Doyle’s tale of J. Habakuk Jephson’s Statement as Gibraltar’s Sherlock Holmes story. 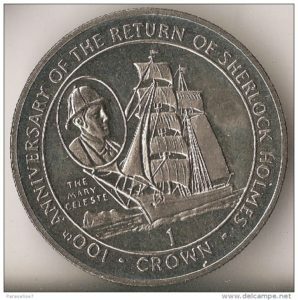 Edward C. Rochette, the 5th Garrideb, suggested the idea of a series of coins commemorating Sherlock Holmes while having discussions with Derek Pobjoy, the head of the Pobjoy Mint in the early 1990’s. Pobjoy Mint then struck 8 different designs in 3 metals – cupro-nickel, sterling silver and .999 fine gold. The press release, issued by the Pobjoy Mint, announcing these coins is somewhat vague and implies that all three coins are Crowns. The Standard Catalog of World Coins 1900-1999 (whose KM catalog numbers we are referencing above) lists the gold coins as being a 1/5 Crown. If this is the case, a slight modification is needed to the reverse description above. Issue prices were $6 for cupro-nickel, $35 for the sterling silver and $165 for the gold coins.